Most of us sense instinctively that the rise of smartphones has had a dramatic impact on the way we work and live. We know it’s made us more connected and available, better able to communicate with colleagues and clients, and quicker to respond to opportunities as they arise. But just how much it can boost productivity has been a mystery — until now. Samsung recently teamed up with Frost & Sullivan to survey 500 managers and executives working at companies or government organizations in the U.S. to learn more about their use of mobile devices and applications in the workplace. The results are remarkable: Respondents report that as a result of using smartphones to get work done, they gain nearly an hour (58 minutes) of work time each day and nearly an hour (58 minutes) of personal time each day on average, and see an estimated productivity increase of a whopping 34 percent. The minutes gained are slightly higher for very large enterprises, while the efficiency increase is strongest among mid-size organizations. Either way, that’s a lot of measurable value. 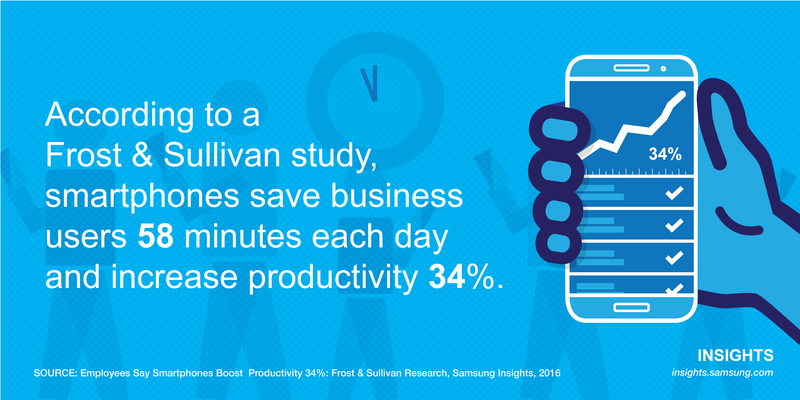 Read the Frost & Sullivan white paper to learn the tangible benefits of smartphones in the enterprise. The use of smartphone apps for business has nearly doubled over the past five years. Today, 51 percent of employees use mandated apps for their business on their phones, up from 27 percent in 2011. (That doesn’t take into account the apps employees use on their own to get work done, without the knowledge of IT.) Custom business apps are now used by the majority of employees in the financial services, healthcare and transportation industries. Unsurprisingly, smartphones are becoming a primary business and productivity tool: 58 percent of respondents say they always or usually use them for business and productivity applications. Companies are using a mix of custom in-house, custom third-party and app store applications to drive productivity. Smartphones are providing a variety of benefits: 42 percent of respondents say they help increase the speed of innovation; many also tout greater flexibility (41 percent), an improvement in the quality of collaboration and the ability to boost productivity (each at 39 percent), and an improvement in the quality of their work (35 percent). More than one-third of respondents see a positive effect on work-life balance, although many also report feeling pressured to stay connected more often. To offset this concern, companies should put clear workplace communication policies in place outlining when employees are expected to be available, and how they should best interact with one another — and their business applications — outside of typical business hours. The BYOD trend is widespread (84 percent) across all industries, with most companies allowing employees and even partners to access the corporate network via their own devices. But as a result, data security is a top concern for 52 percent of respondents, especially in regulated industries, and more than two-thirds view the security risks posed by employees and partners with smartphones as very or somewhat significant. To mitigate these risks, companies are using encryption (46 percent), VPNs (43 percent) and authentication (38 percent). Despite these great results, smartphones are still provided to employees less often (27 percent) than desktop PCs (62 percent) or laptop computers (43 percent), but they’re the top personal device (73 percent) used for business. This suggests that many companies haven’t caught up to the new workplace reality. Frost & Sullivan believes that smart companies will take advantage of this gap to get a quick leg up on the competition in the months and years to come. By outfitting their employees with smartphones now, companies can see dramatic results around productivity, workplace communication, time management and work-life balance — all of which contribute to the bottom line. Samsung’s line of enterprise-ready smartphones provide the power, performance and security essential for today’s mobile workforce.